Umphrey Green Smith (1843-1927) was born in Alabama, lived in Oklahoma and died in Arkansas. 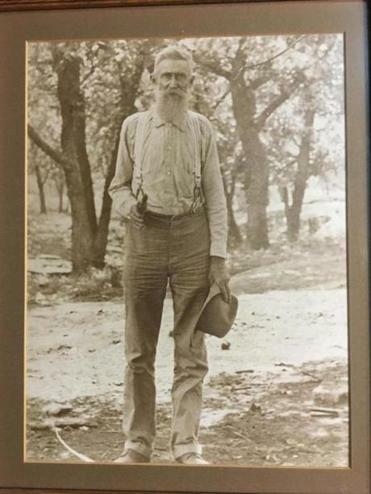 Hanging by the stairs in my parents’ home in Texas is a photo of my great-great-great-grandfather, Umphrey Green Smith. He has a white beard that reaches to his collar and is holding his hand outstretched to the camera, as if he wants to shake your hand. His ears stick out a good deal, giving him a slightly goofy look. Growing up, I was told Smith was my Cherokee ancestor, a medicine man who had no fear of snakes. My granny, a former true-crime journalist who spun elaborate tales out of our family tree in her retirement, was enamored of our supposed Native American roots, filling her home in Oklahoma near the Texas border with Cherokee and Comanche paraphernalia and history books. I thought about my ancestor and his sepia-toned legend last week while covering Senator Elizabeth Warren’s speech to the National Congress of American Indians in Washington. Warren has been derided by President Trump and others for claiming Cherokee heritage, despite not being able to prove the connection. Warren told the crowd that she still believes her mother was Native American, but added that she recognizes and respects the fact that her relatives weren’t on the rolls of any tribe — her first acknowledgment of that distinction. After the speech, I called one of Warren’s loudest critics on the issue on the left, the Cherokee activist Rebecca Nagle. Nagle called the speech a good first step, but she implored Warren to look closer at the stories she was told as a child about her ancestry. As far as I can tell, I’m one of those people. Unlike Warren, no one in my family officially identified as Native American, as the senator did in a national directory of law professors. But we loved the story about our ancestor who could make turkey calls, tame snakes, and heal sickness. The notion that we had a tiny bit of Cherokee blood made the rest of my Scottish-Irish, Irish-Irish, and German heritage seem a little less ordinary. I remember thinking as a child that one of my older brothers, who tanned slightly easier than the rest of us (read: at all), must have gotten more of the Cherokee. As I got older, I became more skeptical of the story, noticing that my granny made many aspirational claims of kinship: from Lady Bird Johnson to University of Texas basketball coach Shaka Smart. Her highest form of praise was to say she believed you were related to us. Then, a few years ago, both my parents got their DNA tested after my mom read that the National Geographic ancestry test would tell you what percent Neanderthal you were. She called me soon after she got her results to let me know she was 1 percent Neanderthal. But as she read through the rest of the results, I realized she was also zero percent Native American. I didn’t say anything to her at the time, but I privately filed the Cherokee stories in my own mind into the “fake news” category. I recently found out my mom did not reach the same conclusion. “Take the DNA test,” a Trump ally and alt-right troll tweeted at Warren after her speech last week. But at least for my family, DNA testing has failed to topple generations of beloved family stories. “DNA tests aren’t that accurate for Native Americans,” my mom said when I asked her about her National Geographic results recently. She has a point. If the family stories are true, my mom would be 1/64th Cherokee, about 1.56 percent. That number is so small that it’s possible it would not show up in her genetic material at all, scientists told STAT News. My mom also says her DNA test identified a small percentage of her blood as East Asian, which she believed could be a mismatch of the Cherokee. A scientist for the National Geographic’s Genographic Project, Miguel Vilar, confirmed that some people with Native American DNA showed up as East Asian during the time period my mom took the test. There is an objective truth here: Either Umphrey Smith was Cherokee, or he wasn’t. But the more I dove into the story last week, the less confident I felt that I was ever going to prove or disprove generations of beloved family stories. The main piece of evidence that Smith was Cherokee is the death-bed testimony of my great grandmother “Granny Smith,” who dictated as much as she could remember of her family history to my grandparents in her final days. It’s from this colorful, typewritten account — affixed to the back of my ancestor’s photo — that I learned Umphrey Smith, born in Alabama in 1843, was a messenger for the Confederate Army in his youth, carrying information in a waterproof matchbox that he tossed into a stew once when Yankee soldiers stumbled onto his campfire. His mother was half Cherokee, Granny Smith said, and born in Tecumseh, Ala., — and from her he learned to cure illnesses with herbs. These tales of youthful Indian prowess are contrasted with memories of Smith as a crotchety old man in Oklahoma who often talked to himself and the family’s cows. He had a stubborn streak: Smith stopped talking to a close family friend for the rest of his life after the friend insulted President Woodrow Wilson, one of Smith’s heroes, for getting the United States involved in World War I. My mom told me she thought her brother had located Smith’s mother on the Cherokee rolls at one point when he was mapping our family tree. But when I called my uncle to check on that, he said he had never found any evidence that Smith or his relatives were enrolled members of the tribe. My uncle said that perhaps there was more information in the giant cedar chest in my granny’s home in Lawton, Okla. But no one seems to have known what Smith’s mother’s name was — making it impossible to look for her on the rolls. My granny, who would know the most about the tale, is in her 90s and no longer remembers the story about Smith that used to so delight her. Warren’s constituents in Massachusetts probably don’t realize how common it is for white people in the South to grow up with stories of distant and heroic Indian ancestors. (And some black Southerners, too: NFL running back Emmitt Smith realized he wasn’t part Cherokee on an episode of NBC’s “Who Do You Think You Are.”) Cherokees married outside their tribe more than other Native Americans — a method of survival in the 17th and 18th centuries — so many people do have distant ties to the group. Their exogamy has allowed thousands of families like mine to claim ancestry, livening up their family trees without ever having to reckon with the genocidal tendencies of some of their forebears. Nagle and many other Cherokees find this casual appropriation of Native identity deeply offensive. But part of why the stories have such staying power for my family, despite a lack of evidence, is because my family is so sincerely proud of having any connection to Native Americans. My granny and my grandfather greatly admired the tribes that live in Oklahoma, and a group of Comanches sang at my grandfather’s funeral, after the military bugler played taps in honor of his service in World War II. Warren’s speech last week was well received by the Native Americans in attendance, who generously accepted her assertion that her mother was Native American, despite a lack of documentation.